Just something I have been playing around with. Maybe you will find one of them useful. The first set has something called a Celtic Shamrock but it bugged me that it only had three leaves. Shamrock’s, I thought, had four! Apparently that is an Americanization. Shamrocks, it seems, have three leaves. Clover, no matter how many leaves if has, is a different plant. I’ll refer you to this post for an interesting discussion, rather than try to paraphrase it and get it wrong. But the point is, I AM American, and I have always associated the four leafed symbol with St. Patrick’s day. Hence my dilemma when designing. What? You think I just sit down and whip something up without doing a LITTLE research? Na. So here you have three different versions. One is the Celtic Shamrock, which is a cross between a Celtic knot and a shamrock (the three-leafed variety). One is a four-leafed version of the knot, in two-tone greens. One is with the four-leafed clover, as I remember it. dithering, waffling, and wallowing in indecision. That’s me in a nutshell. Maybe I’ll just cast on a whole new pair that I can do 2-at-a-time, or finish up the one 2nd sock I already have half way done. 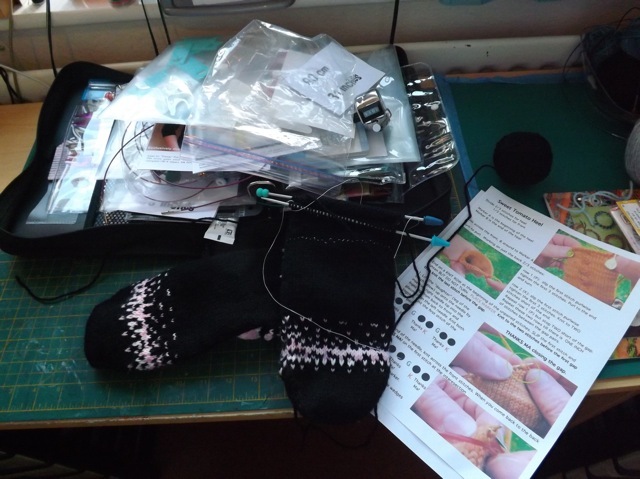 I was a little wary of starting the heel on my socks, never having done the STH before. 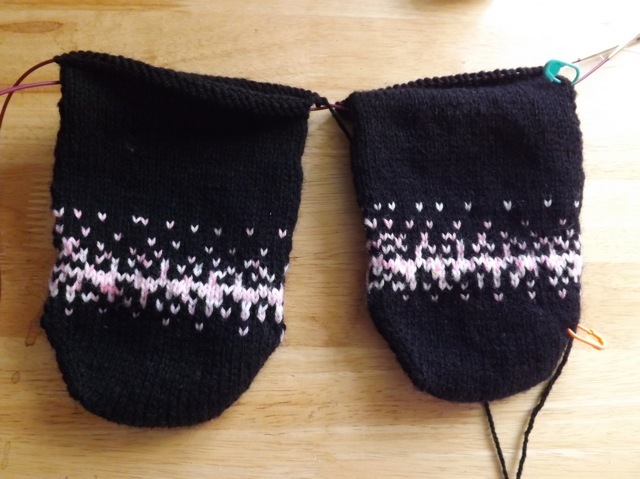 I wanted to put in a lifeline, so that if I hated it, or it didn’t fit right, I could rip it back to just before the heel without worrying about going too far. I was going to use dental floss, as I had heard that was a good thing for lifelines, but then I kept reading how it maybe wasn’t so good. So I decided to use some cord that I had. It was till thin and smooth but not floss, so I thought it would work. 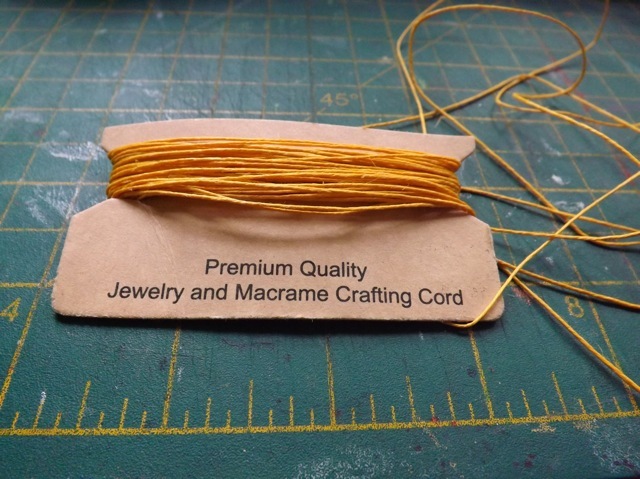 All you have to do is thread the thin whatever thru the hole in your interchangeable needles and knit as normal. You have to be a little careful to ensure the cord stays in place as you pull thru, but…. Jeez. That looks like a hot mess, but if you follow the numbers hopefully you will see how it works as you do it. You are basically knitting around to the middle back, pulling out a bit of extra at the left, then cutting in the middle. Knotting the cut end and the starting end secures the completed lifeline around the LEFT sock. 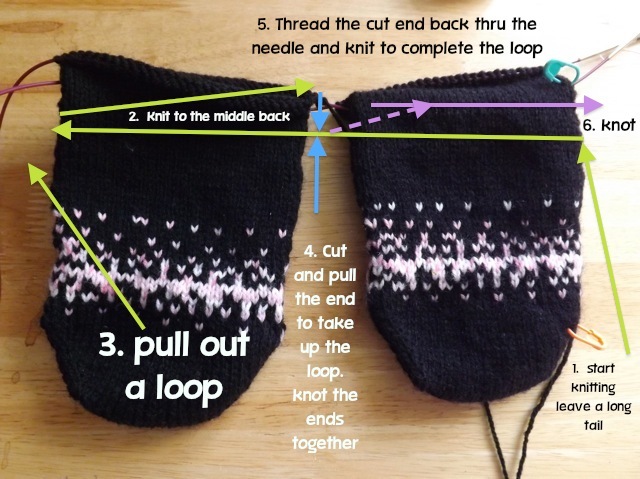 Threading the cut end back thru the needle and completing knitting the back of the RIGHT sock then knotting the last two ends secures the lifeline on the RIGHT sock. In the end it didn’t matter because I always assume I need bigger socks than I do. 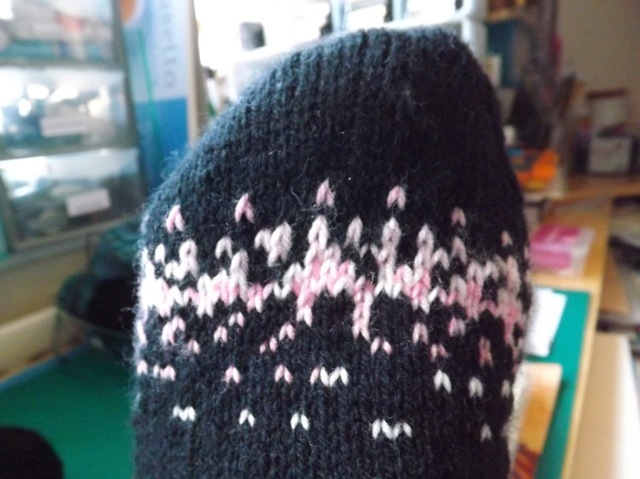 The heel turned out fab, the ribbing was great (but the stretchy bind off was too stretchy – first time I’ve had that problem) so I ended up ignoring the lifeline and ripping back to the cask on, knocking off 12 stitches and casting on a much smaller sock that fits. a couple of little flaws in the colour transitions at the heel (found a project note on Ravelry for that) and in the ribbing but that was OK as it was all practice and I didn’t mind doing it KNOWING I was going to frog it at that point. 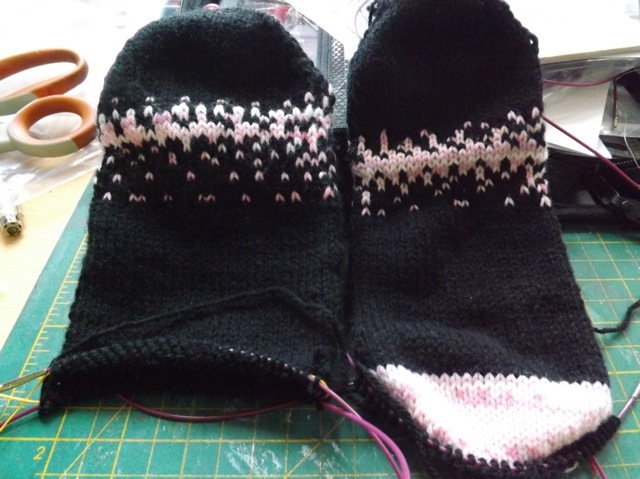 The new one fits perfectly and the heel is starting out nicely…. I think you can see the difference in the size! I still want to buy the e-book for the STH but still getting an error. One more try and if it doesn’t work I’ll either buy it via a proxy or ask someone from the US to gift it to me. The video is an excellent start but I still think I am messing up on small step. DHs birthday today. Lots to do …mexican feast for dinner. I won’t say what lest he drop by here today. Short day for DD, skating in the afternoon, so won’t get much done on these today. but maybe I’ll be to the point I can wear them next week! Yippee. Categories: knitting | Tags: knitting | Permalink. 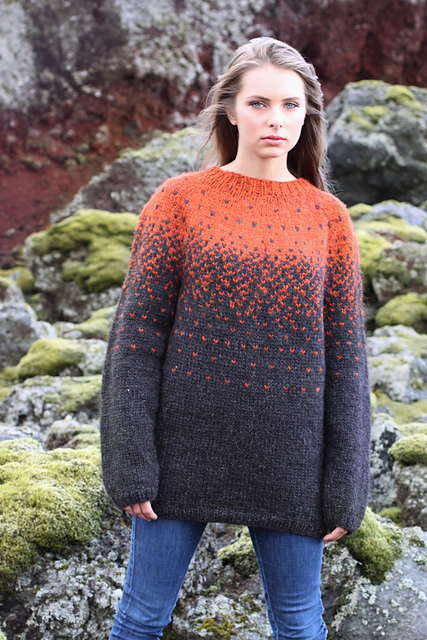 I mentioned that I was quite taken with the scatter pattern in a sweater i saw briefly in a magazine at the checkout. I can’t help with what magazine it was cause I just don’t recall. But I did have a look for “scatter sweater” and up popped a free pattern on Ravelry. It looks like the same one I saw! I had a look at the chart for the pattern but could not get my head around it. There are two charts and my eyes struggle to see the pattern in them. So thinking back to what I did, which was to alternate rows with regular repeats and moving from more of one colour to more of the other, interspersed with full rounds of a colour. I charted, sort of, my version. 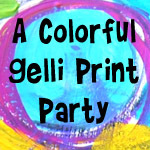 I’m trying something new if you click on the image I hope it will download a PDF for you. 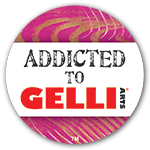 If not, clicking here will! You can follow the chart exactly or follow it but just change the odd stitch or two like I did. Over all the pattern is easy to remember for each round so not at all stressful. You aren’t carrying a colour over more than four stitches. 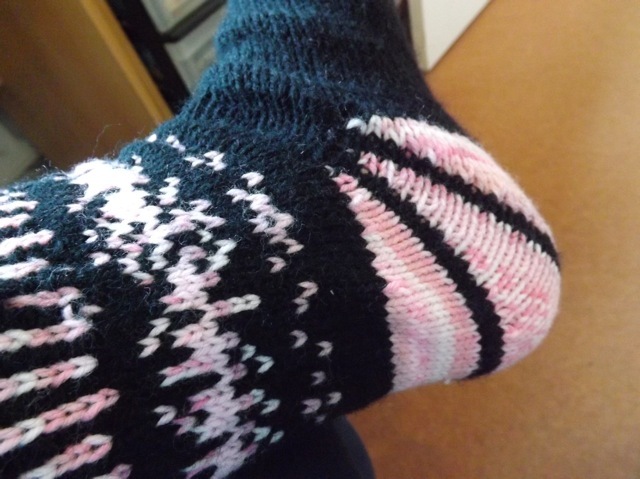 I used variegated yarn – while it may look like more than two colours it really is only pink and black. I do my socks in magic loop. I don’t like to strand the yarn too far at the sides, when moving from one side of the Magic Loop to the other. So I just made sure to alternate the colours for the last two and first two stitches at either end for any row that wasn’t a full round in one colour. I have no idea what it would be like on DPNs. 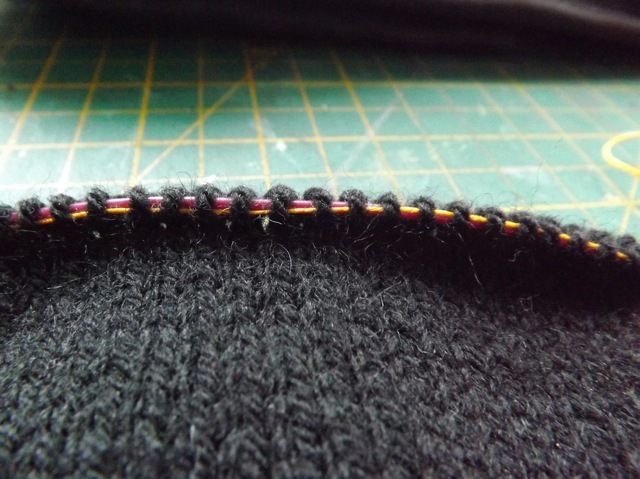 I tend to keep my stitches pretty spread out on the needles to keep the stranding at the back from getting too tight and I think that would be harder on DPNs. Hopefully it will be useful to someone. I have to say I love the effect and may have to do it on a sweater at some point to see how it works out. Well it’s been a while. I refuse to bore you AGAIN with the stupid saga of my rubbish internet. Instead I will show you what I have been doing while offline. Knitting! The sheet of paper is for Cats Sweet Tomato Heel. It’s one I have wanted to try but when I finally got around to trying to buy the e-book I keep getting an error. It’s all that new EU VAT stuff, I’m sure. But there is a YouTube video so I just watched that, made note, did some screen grabs and created my own little PDF of what are the important bits for me. Unfortunately they are a little loose, I think. I have LONG feet but they are fairly thin, so I always struggle to get then to fit perfectly. Being that I am using them to learn a few things I went with slightly coarser yarn and slightly larger needles. 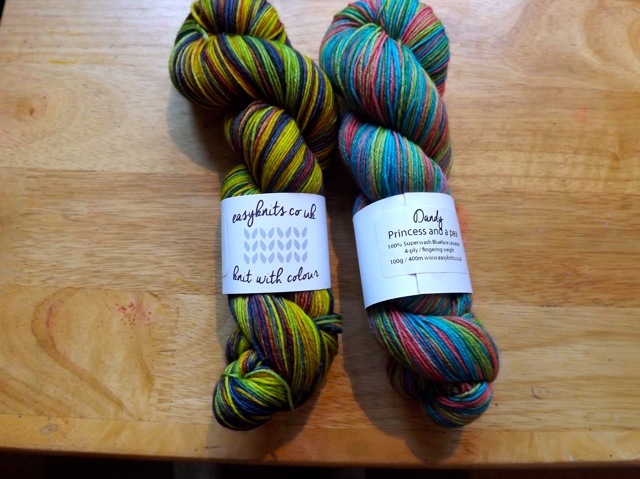 They will have the Sweet Tomato Heel, probably in colour wedges, I think, and a two-colour ribbing. A lot in one sock. Funky! The other big project is a sweater. Also a learning tool, the lace chart for the yoke. Ugh. Hate charts like I hate spreadsheets. The two sleeves are on a VERY long circular. 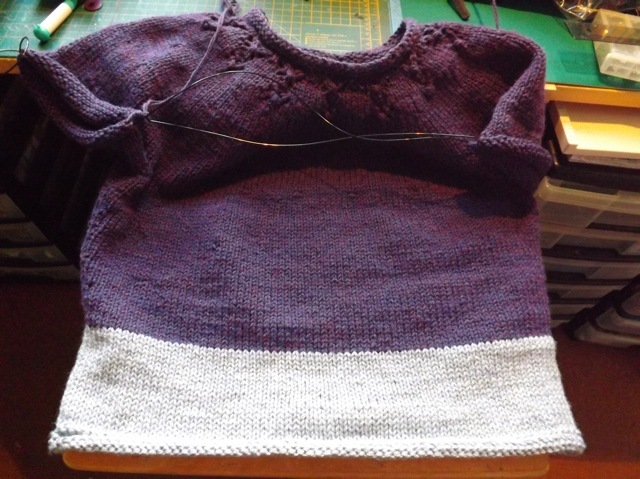 They will be knit to the length of the purple on the body then finished off in the grey to match the block at the bottom edge. A few printables will be dribbling out and I need to now start thinking about the ATCs for WOYWW 6th anniversary, so it’ll be a real mixed bag for me in the coming weeks. Just how I like it! Looking forward to catching up and seeing what everyone is doing. I have a few things that I’ve been playing around with while I was offline. I thought I would add one today as I ease back into blogging. A printable, not too complex. but with a font I am really fond of. 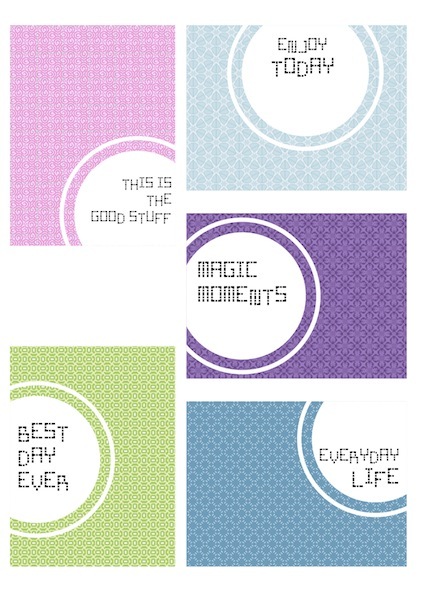 Just basic filler cards, colourful, with simple bits of text. 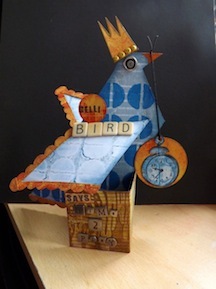 Lots of room to add embellishments of maybe even a bit of journaling on a label, or even a small (very small!) photo. One thing I do miss about getting photos printed is the little index prints. I used those small inch-size images all the time. Something that sort of size would work on these. Single page PDF and hopefully a mix of boyish and girlish colours. I often think, when I am designing, that I should always do two pages. So all of one set boy and generic colours (blues, greens, oranges yellows) and the other more girlish ones (pinks, purples, apricot, celery) rather than a mix on one sheet. What do you think? Just to update on the whole internet thing – BT stopped fibbing about replacing the cable and acknowledged that the work was “too expensive” for the sake of one person (me). They did something that made it better (personally I think they swapped MY lines with someone else who wasn’t going to complain and not let up about it, like I was doing) and while I am still getting 1000s of errors showing in my router stats, I am not dropping every 5 minutes, or even every night/every time it rains like it was before they totally broke it. And it only took 5 engineer visits, a solid 15 hours of working time for them (not to mention the waiting around time and weeks of lost productivity for me) to sort it. The speed is less than my router is telling me I am getting but it better than it was.